This is a toothsome, satisfying meal. It is healthy, spicy, flavorful, and strangely addictive. Put a large pot of water on to boil, add 1 T salt. When the water boils, add the cauliflower florets and cook for 5 minutes. Remove the cauliflower from the pot with a slotted spoon and drain. When the cauliflower has cooled off a bit, chop it coarsely and set aside. Keep the water warm for the pasta. Heat the olive oil in a large nonstick frying pan over medium heat. Add the onion and cook, stirring occasionally, until it starts taking on color. Add the garlic and hot pepper flakes and cook another couple of minutes, until the garlic turns golden. Add the parsley, salt, and pepper, and stir well. Continue cooking over medium low heat, stirring occasionally. Meanwhile, bring the water back to a boil and add the fregola sarda. Cook according to the package directions, roughly 10 minutes. Test for doneness. 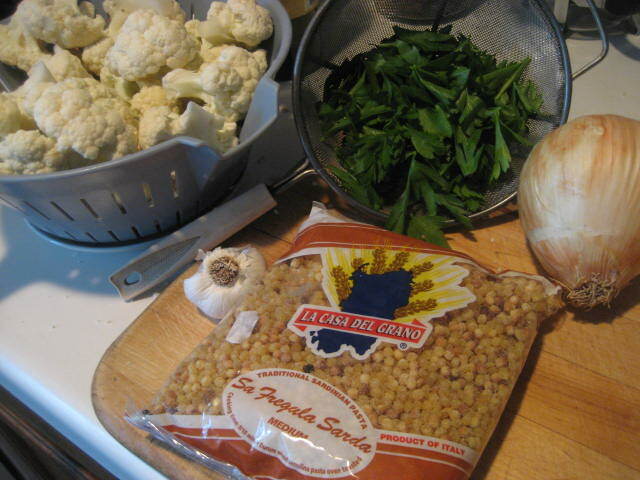 When the fregola sarda is al dente, scoop it out of the water and add it directly to the cauliflower mixture, stirring well. 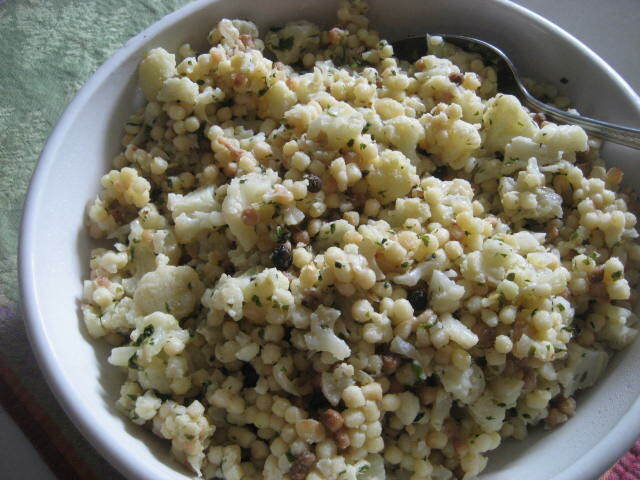 This entry was posted in main dishes, vegan and tagged cauliflower, fregola sarda, pasta. Bookmark the permalink.